The business community is constantly abuzz with future predictions about how our workplaces will look and behave in the future. At PLN Group we spend a lot of time eagerly following and researching these prophecies in relation to workplace strategy, and also making quite a few of our own. This is why we jumped at the opportunity to not only sponsor, but also attend, a new conference last week in Auckland called Workplaces and Workforces of the Future. Both home grown and international thought leaders covered topics relating to managing people, spaces and resources through change. Attendees with an interest in change management, human resources, workplace strategy and design, and technology benefited from practical insights in how to prepare, predict and plan for the future of their organisation. Predictions and crystal balls aside, the common theme that we heard from all speakers was that the future is actually already here, and so is the opportunity to boost productivity (as much as 15% over the next 10 years). Some of our own NZ companies are already doing this with real success. The local insights and case studies were of particular interest to the largely New Zealand audience. 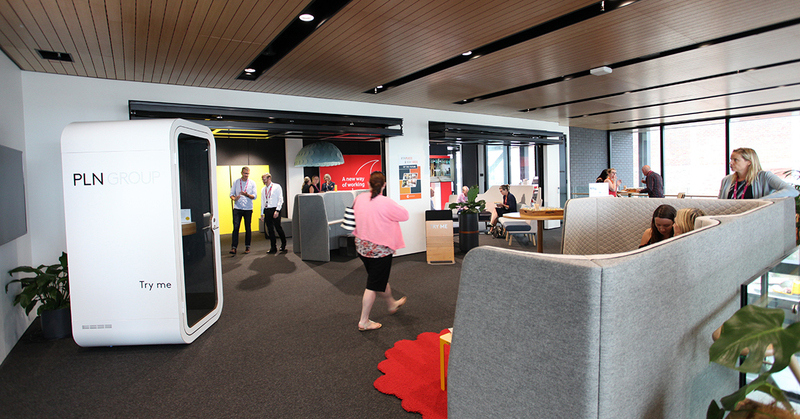 Vodafone has recently brought its entire team of 1800 together in one location on the North Shore. With a variety of work environments: open plan, collaboration, libraries and private spaces – one major challenge was how to enable workers to work effectively across the entire organisation while remaining connected and engaged. Human Resources Director, Anthony Welton, shared how they have created a world-class innovation precinct where smartphones are used as “passports” by employees to access reception, book meeting rooms and desks, print documents, access lockers, and even contact the valet service and pay for meals within the building. It has resulted in one of the most technologically advanced work environments in New Zealand. We’re keen to see how these investments in technology are reflected in their employees’ productivity over the next few years. Fonterra has the all too familiar challenge of integrating five generations of employees, each with their own set of skills and preferences, into unified and successful teams. According to Mahara Inglis, General Manager of Strategic Capabilities, the company has looked to develop ‘gamified’ learning apps as one method of appealing to generations such as the Millennials who tend to respond less readily to more traditional learning tools. This has allowed more effective training and enabled smoother change management. While we’re still really excited about the future and the opportunities it offers for new styles of work, we agree that the future truly is already here in some of the solutions we’ve designed for our own clients. Looking ahead, our team is invigorated by the challenge of designing for a future workplace driven by the changing nature of work. One thing all experts agree on is the need to be more competitive, agile, and customer focused. Like Vodafone and Fonterra we must also take advantage of the communication and information technology breakthroughs that enable work to be separated from time and space.